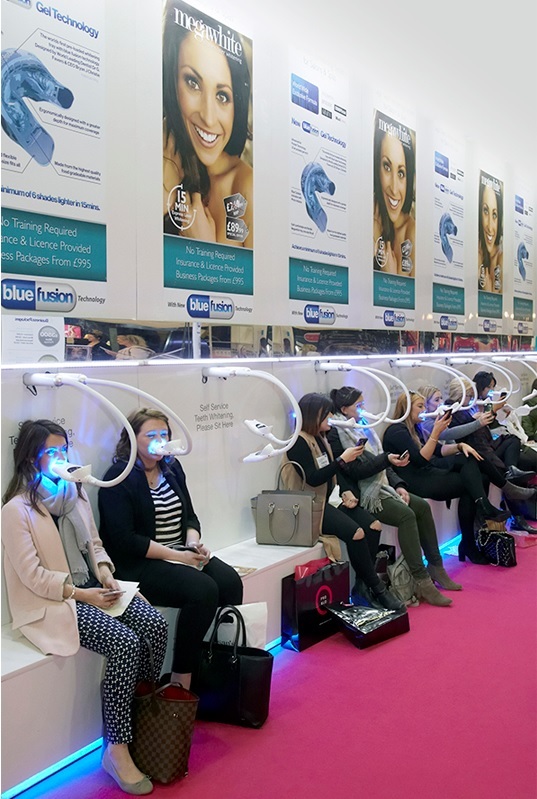 Teeth whitening is big business now in the UK. I see teeth whitening being performed everywhere. It’s at all the exhibitions I go to and becoming a lot like Botox parties. More and more companies are investing in Teeth whitening. But are there any controls. People are sitting in a row in public areas having their teeth cleaned. There is no sterile field or work area. In my second Beauty Salon I had a Dentist who performed whitening the teeth with a company called Zoom. With just a letter to me his nurse could perform his teeth whitening treatments. All my clients complained of terrible pain for the first 24 hours and then incredibly sensitive teeth. I stopped this practice on my premises. But what is happening to us? In my lifetime it has never been normal to have brilliant white sparkling teeth. Americans have always been like that but Europeans haven’t. We all want our teeth to look clean. I feel I am too old to have extra white sparkling teeth but I want them to look nice. 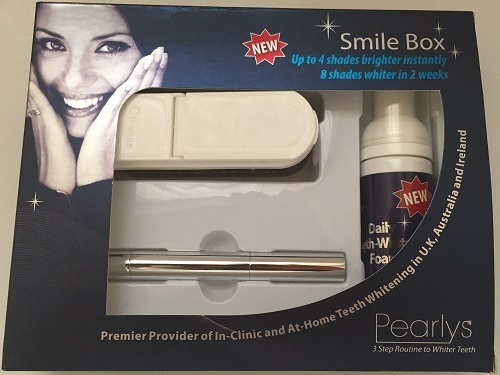 I have been using a product called Pearlys Smile Box which is a 3 step routine to whiter teeth It is gentle. I have tried it for almost a year. It comes with a powder to use once or twice a week and a foam with anti bacterial actions to clean and a white pen to use at night which I haven’t used. I do have cleaner whiter teeth and my teeth have not become sensitive or lost any enamel. If you want to have the American smile then Megawhite is promoting itself everywhere and out pricing most of the established companies. I say be careful as teeth whitening can cause sensitivity for life and destroy the enamel on teeth. I am fearful of them breaking the law here. “The GDC brings criminal prosecutions under the Act where there is sufficient evidence that an individual is practising dentistry without being registered with us. Any prosecution is brought in the public interest – principally for the protection of the public – in accordance with our statutory duty to exercise our functions having proper regard for the interests of persons using or needing the services of registered dentists or registered dental care professionals in the United Kingdom. Several companies, which produce tooth whitening systems, maintain that since the products used for tooth whitening are covered by the European Council Directive on Cosmetic Products 2011/84 EU (“the regulations”), their agents are carrying out a cosmetic procedure and not practising dentistry. This is an incorrect interpretation of the law. The regulations state that products containing or releasing between 0.1% - 6% hydrogen peroxide should not be made directly available to the consumer, other than through treatment by a registered dentist (or dental hygienist or clinical dental technicians or dental therapist working to a dentist’s prescription) Breach of these regulations is a criminal offence. In addition it is illegal under these regulations for tooth whitening products which contain more that 6% hydrogen peroxide or for any associated products which release greater than 6% hydrogen peroxide to be supplied or administered for cosmetic purposes.